In the area of science, the presented maxim requires great perseverance and is slightly contrary to the current trends in the scientific development. Looking critically, the race according to the trends consists in choosing the scientific topics that are most frequently published and for which an adequate scoring can be obtained. On the other hand, the activity in the area of application requires a substantial amount of work, competence and executive skills in the domain and scientific fields. In my scientific work, I have been oriented towards a practical implementation of achieved results of the research. In terms of AGH work, I have been a manager or an executor of many research projects. Szmuc, T.: “Formal methods and tools supporting the design and analysis of real-time software for controlling processes.” (In Polish: “Metody formalne i narzędzia wspomagające projektowanie i analizę oprogramowania czasu rzeczywistego do sterowania procesami.”) Grant: KBN 8T11A01308. Implementation: AGH, 1995-1997 (executor). 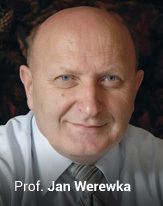 Werewka, J.: “Analysis and design of real-time computer systems with various distribution levels.” (In Polish: “Analiza i projektowanie systemów komputerowych czasu rzeczywistego o różnym stopniu rozproszenia.”) Grant: KBN 8T11C 039 14. Implementation: AGH, 1998-2000 (project manager). Werewka, J.: “Designing structures of field buses for distributed control systems. (In Polish: Projektowanie struktur magistral miejscowych dla rozproszonych systemów sterowania.) Grant: KBN 8T11A 013 16. Implementation: AGH, 1999-2001 (manager of the promotor project). Werewka, J.: “Time analysis of distributed control systems based on field buses.” (In Polish: “Analiza czasowa rozproszonych systemów sterowania bazujących na magistralach miejscowych.”) Grant: KBN 8T11A 007 18. Implementation: AGH, 2000-2001 (manager of the promotor project). Szmuc, T.: “Application of formal methods in the development of correct real-time systems software.” (In Polish: “Zastosowanie metod formalnych do wspomagania wytwarzania poprawnego oprogramowania systemów czasu rzeczywistego.) Grant: KBN 4T11C 035 24. Implementation: AGH, 2003-2004 (executor). Werewka, J.: “Modelling and analysis of interactive Internet systems servicing the high-frequency offers.” (In Polish: “Modelowanie i analiza interaktywnych systemów internetowych realizujących obsługę szybkozmiennych ofert.”) Grant: KBN 3T11C 022 30 (manager of the promotor project in the Rzeszow University of Technology). Around 2001, I was highly successful in terms of obtaining grants. It was connected with the work of the teams, of which I was the manager, that were conducting research on analysis, modelling and structure of real-time computer systems. These activities resulted in the 61st place in the top 100 of information scientists. According to the informational magazine of the State Committee for Scientific Research (KBN): Biuletyn Informacyjny Sekcji Informatyki Komitetu Badań Naukowych, no. 17, published on 10 November 2001, the rating took into account information scientists that use modern calculation methodologies (so-called computer methods in science). The list included the data from 21 competitions, that is from the beginning of the KBN existence. The list was arranged based on the number of research projects, goal-oriented and ordered, that were accepted for financing by KBN and their total amount of co-financing. Grega, W., Werewka, J.: “Decomposition methods in tasks of optimising transportation systems.” (In Polish: “Metody dekompozycji w zadaniach optymalizacji systemów transportowych.”) Research problem: CPBP 02.15: Development of system research and its priority applications. A research report of the Faculty of Automation, 1989. Wala, K., Werewka, J.: “CARBON – a computer-aided system for programming the development of lignite mining.” (In Polish: “CARBON – Komputerowy system wspomagania programowania rozwoju górnictwa węgla brunatnego.”) Research problem: CPBR 1.7: Increasing the efficiency of extracting and using the natural resources (as part of the cooperation with the AGH Department of Surface Mining), 1989. The whole cooperation with doctoral students was directed towards searching for scientific solutions to IT sector issues. The considered issues pertained to the structure of real-time IT systems. The exemplary results are the solutions pertaining to the analysis and modelling of field buses and asynchronous communication, the multiprocessor systems of controlling robots, the structure of the supervisory system of controlling accelerators, and modelling and analysis of interactive Internet systems with high-frequency offers. All these works required deep domain knowledge apart from the knowledge from the real-time information technology field. In Poland, the National Qualifications Framework (NQF) is in force. According to this framework, when evaluating and accrediting higher education institutions, the level of adjusting the syllabus to the needs of the labour market is taken into consideration. To me, this has always been one of the most important goals in the process of teaching. Adamski, A., Grega, W., Werewka, J. et al. : Rules for automated traffic control in Kraków. (In Polish: Zasady sterowania automatycznego procesem ruchu ulicznego w Krakowie.) Municipal Road and Greenery Institute (MZDiZ) and Municipal Office of Kraków, 1978. Adamski, A., Gorczyca, P., Grega, W., Hajduk, K., Kornecki, A., Korytowski, A., Werewka, J., Kosiorowski, M., Lany, M., Lyszczek, K., Gasiorowski, T. et al. : Rules for automated traffic control in Kraków. Development of a model for optimising vehicle allocation in the network. (In Polish: Zasady sterowania automatycznego procesem ruchu ulicznego w Krakowie. Opracowanie modelu optymalizacji alokacji pojazdów w sieci.) Municipal Road and Greenery Institute (MZDiZ) and Municipal Office of Kraków, 1979-1980. Gorczyca, P., Grega, W., Turnau, A., Werewka, J. et al. : Construction of a prototype measurement bus and development of software for processing the measurement data. (In Polish: Budowa prototypu autobusu pomiarowego oraz opracowanie oprogramowania przetwarzania danych pomiarowych.) IOiKS Warszawa (the work as part of the department issue), 1980-1981. Grega, W., Werewka, J. et al. : Adaptation of the OPTYBUS system for creating timetables for the needs of Municipal Transport Company (MPK) in Kraków. (In Polish: Adaptacja systemu OPTYBUS w zakresie tworzenia rozkładów jazdy dla potrzeb MPK Kraków.) Municipal Transport Company (MPK) of Kraków, 1982-1983. Grega, W., Werewka, J. et al. : Adaptation of the OPTYBUS system for the needs of Municipal Transport Company (MPK) in Kielce. (In Polish: Adaptacja systemu OPTYBUS dla potrzeb MPK Kielce.) Municipal Transport Company (MPK) of Kielce, 1984-1985. Grega, W., Werewka, J. et al. : Implementation of the OPTYBUS system in Municipal Transport Company (MPK) in Kielce. (In Polish: Wdrożenie systemu OPTYBUS w MPK Kielce.) Municipal Transport Company (MPK) of Kielce, 1985-1986. Grega, W., Mrozek, Z., Werewka, J. et al. : Design of a new version of the OPTYBUS system for a computer compatible with IBM/XT and the development of selected programs of this system. (in Polish: Projekt nowej wersji systemu OPTYBUS na komputer kompatybilny z IBM/XT oraz opracowanie wybranych programów tego systemu.) MPK Kielce, 1987-1988. During the next stage of the development of programming languages, I was a forerunner of introducing the C and C++ languages to the syllabus. I have written many systems in these languages that can be applied in the IT sector. Additionally, three scripts for students were created that comprised practical aspects of programming in these languages. During the following stage of my didactic activity, I became focused on running classes on IT project management and modelling and application of enterprise architecture. In particular, I concentrated on the two most popular methodologies of project management: Scrum (agile methodology) and PMBOK (classic methodology), and the integration and scaling of both methodologies. What is more, I also noticed the need to develop managerial staff for people working in the IT sector. IT project management education was particularly important. The economic value of these proceedings is high due to the fact that only 1/3 of the IT projects is fully successful. That is why I proposed the below described project that was approved for realisation. The project realised based on the Agreement no. UDA-POKL.02.01.01-00-394/09 from 30.09.2009 (reference number of the aid program: K(2007) 4547 from 28.09.2007) between AGH University of Science and Technology and Polish Agency for Enterprise Development for co-financing the project that was part of the Human Capital Operational Programme. The project was implemented as part of Measure 2.1 Development of human resources for modern economy and Sub-measure 2.1.1 Development of human capital in enterprises. These studies have been and still are very popular. The postgraduate studies allow students to present problems of the IT sector or issues that should be improved in their own field of action. The so-called final works consist in students presenting their proposals of the solutions. The list below contains examples of final works, the full content of these works is available on the website of postgraduate studies on IT Project Management. The compilation edited by Jan Werewka entitled Selected issues of managing projects in IT enterprises (in Polish: Wybrane Zagadnienia Zarządzania Projektami w Przedsiębiorstwach Informatycznych) is an exemplary collection of final works of postgraduate students on IT Project Management in 2012/2013. The way of developing software and the ways of structuring it are changing. The common issue is the development of IT systems through the integration of different software components coming from different sources. Additionally, another important issue is the customisation of software according to the business needs. During the classes on architecture and modelling, solutions pertaining to the enterprise architecture (the architecture oriented towards services) are proposed. What is also important is the form of conducting didactic classes and leading master’s thesis composition. The applied way consists in defining a practical problem, analysing existing solutions and suggesting the best engineering solution. In the case of project classes, task solving is performed in groups. If possible, the tasks can be carried out by different project groups oriented towards solving a common issue (capstone), similarly to the way it is done in IT companies. As part of my work within the IT company, I take part in solving problems that are associated with IT project management, business processes optimisation, software systems and architecture development, and identification and evaluation of IT competences. I am one of the co-founders of ATSI S.A., an IT company that was founded in 1997. I have been leading the company as its CEO on a basis of the management contract since the beginning of its existence till end of June 2014. In the Puls Biznesu ranking of 500 Managers in 2013, I was listed in the 153rd position (http://kariera.pb.pl/3501118,23427,500-menedzerow-roku-ranking). According to the Puls Biznesu portal, the people included in the ranking are the most resourceful and active figures in the Polish business that demonstrate highly imitable attitude. The ATSI S.A. (Advanced Technology Systems International) company has introduced, as one of the first in the region, the integration of classic and agile product and process management. The effective and iterative product development was our main goal. We are strongly focused on involving clients in the development process and on delivering high-quality products as fast as possible. Our advanced development process is based on automated tests, continuous integration and deployment. The preparation of the system software for licensing and certification by global institutions is playing a key role in this process. Product and project management. The main goal is to find optimal solutions concerning product and process management basing on scalable, agile and lean approaches. Development of architecture governance in the software product development lifecycle that is related to all enterprise architecture levels (motivation, business application, technology, implementation and integration). Software development processes based on software product lines. Competences in architecture, software development, product and project management. ATSI S.A. is constantly evolving and currently we employ over 250 professionals from different fields – architects, developers, testers and designers. Working in accordance with the objectives of agile methodologies, such as Scrum or Kanban, we develop, using the latest technology, multimedia software based on large-scale distributed systems. Our efforts have been awarded with, among others, the Business Gazelles, Gepard Biznesu and Forbes Diamantes awards. We are also a Microsoft Gold Certified Partner. Business Gazelles is an annual ranking of the most dynamically developing small and medium-sized enterprises. The ATSI S.A. company was awarded the Business Gazelles title in 2009 and 2011. In 2012, it became a large company and therefore is not allowed to participate in the ranking. In 2010, the Gepard Biznesu title was awarded to companies whose market value increased in the period from 31 March 2008 to 31 March 2010 by 10%. In the Year 2014 Forbes Diamantes were awarded to companies which have reached corresponding high incomes. ATSI S. A. has reached first place regional and 14th place in the Poland list. The company uses the technology stack consisting of different solutions. We build successful Microsoft-based IT systems. We are the Gold Certified Partner of Microsoft in the Independent Software Vendor segment, which means that we are Microsoft’s most highly accredited independent technical support providers and we offer a comprehensive range of support for Microsoft and multi-vendor products. The company is oriented towards continuous development of employee competence in terms of developed software. The following paper that was written by Jan Werewka, Krzysztof Jamróz, Dariusz Pitulej and Karolina Stępień may serve as an example of this approach: “A problem of development and assessment of architecture competences in IT companies”. The example of an innovative action was the “Innovative employee – innovative manager – innovative company” (in Polish: “Innowacyjny pracownik – innowacyjny menedżer – innowacyjna firma”) project that is briefly summarised below. The Innovative employee – innovative manager – innovative company EU project was conducted at the ATSI S.A. company in the period from 1 October 2012 to 31 August 2013. The project was realised as part of the Human Capital Operational Programme 2007-2013 (Priority VIII Regional human resources, Measure 8.1 Development of staff and enterprises in the region, Sub-measure 8.1.1 Supporting the development of professional skills and consultancy for businesses) that was co-financed by the European Social Fund of the European Union.